Have you always dreamed of creating that perfect nursery, bedroom or playroom for your munchkins but have been too busy (or lazy) to do it? Enter to the rescue Kinderwood, a specialised interior design service to help you create stunning spaces for your kids. Boost your bubs’ creativity by turning the walls in their room into a live chalkboard, where they can scribble or draw to their heart’s content. This will instantly enliven up an enclosed space making it into a fun interactive zone. You can even doodle along with them to create a different theme every day. Get Kinderwood to apply magnetic paints on the wall and toss up some magnetic alphabets or animals pictures or a tangram with magnetic backs and your kids will never be fussy about studies again. Or you can give your car-obsessed child, a magnetic race track on the wall, where he can zoom along with his fancy toy car. The possibilities are endless! According to the educationist and physician Maria Montessori: “A child should have freedom of movement, and should be able to move independently around his room.” Kinderwood can provide you with furniture that is safe, functional, does not limit movement and can be fun-looking at the same time. For instance, you can check out their range of floor beds that can be used from a very young age as there is no fear of falling down, also unlike the crib the child does not outgrow these. 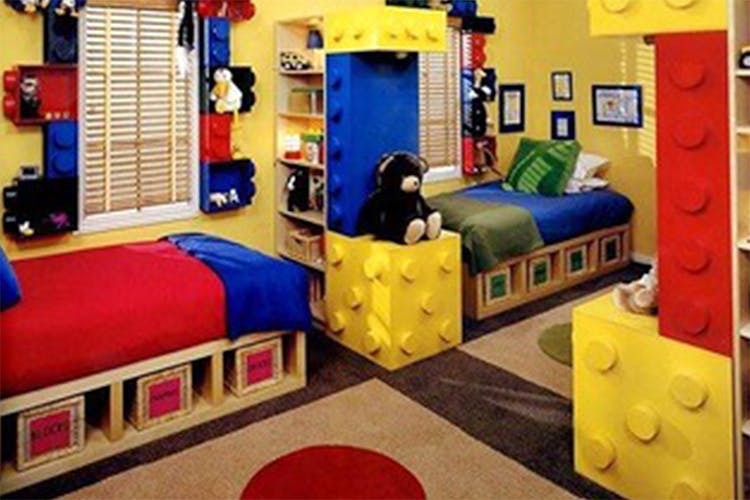 One of their most popular themes is the lego furniture that really takes the quirk and fun a notch higher. Lights play an important role in enhancing the effect of a customised decor. Kinderwood offers you a variety of choices to light up your kid’s room creatively. For an overall pleasing glow around the room, you can go for their bright colourful wall mounted lights. Add up a few task lights to help with studies, bedtime reading or dressing up. If your child is not too comfortable sleeping in the dark then you can get them to add some soothing fun night lamps. Kinderwood also provides accent lights to flaunt your kid’s artwork, an architectural feature or a fun piece of decoration. Take all the cues, advice and help you can get from Kinderwood (first of its kind in Kolkata) to gift your children a comfy, cosy, creative space that is their haven from the chaos of the world outside. Call (90077 17744 / 91637 66594) or Hit up their website here or their Facebook page here.